We've been adding new 5 gallon buckets to our infrastructure for the past year and it still seems like we need a few more. The guy we bought our worms from had an impressive inventory of used buckets. He gets them from a bakery for free and just has to rinse out the icing. I suspect the plastic handle might give out sooner than our store bought buckets, but does longevity matter as much when the replacement cost is zero? I think I'll give this a try with the bakery inside our grocery store the next time I go shopping. I've never commented before but I really enjoy following your stories! I work for a nature center centered on an island of South Carolina and we faced several thousand five gallon buckets discarded every year by the island's hospitality industry - we're working on creative ways to try to divert those from the landfill. So you may want to check in with a hotel; you probably don't want the ones with the more aggressive chemical cleaners, even for carting around compost, but dish-washing detergent should be fairly benign once well rinsed out. I probably should have told Mark to sit down before I read him your comment. He was so shocked, I was a bit worried about him. 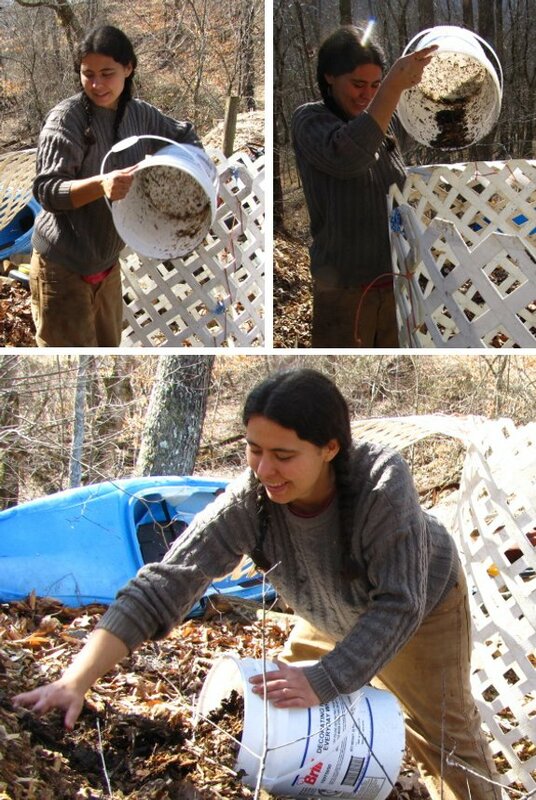 Throwing away five gallon buckets! We'll have to follow your advice and try to find a hotel with a restaurant to get them from. @Sarah: Most plastic buckets are made from polyethylene ("PE"). If you rinse them out properly with lots of water, it doesn't matter if they've contained detergents or cleaners, since PE can withstand many chemicals and doesn't really absorb them. Really dangerous chemicals are as a rule not packaged in plastic. And since detergents as a rule end up in the drain anyway, cleaning out the buckets doesn't really matter wrt releasing extra material in the environment, provided it is properly diluted. Currently the second best way (after re-using them as buckets ) to recycle them is to gather them for cleaning, shredding and re-use as injection moulding material. If that is not cost effective, incineration is a good alternative if it is done in a proper incinerator. @Anna; what do you do with the buckets when you can't use them anymore? That's good to know about chemicals not being absorbed into the plastic! We've been using them to make drift fences to sample the local herps for our kids' program. Glad to know that it's not hurting the toads and other sensitive critters. Wow --- that's a creative use of old buckets! Roland is always spot on about his chemical data, so it sounds like you can rest easy.